This 41st edition of this SIGNIS Salutation Ceremony in Sri Lanka will be held under the auspices of Malcolm Cardinal Ranjith, Archbishop of Colombo, and SIGNIS International Chairman, Helen Osman. 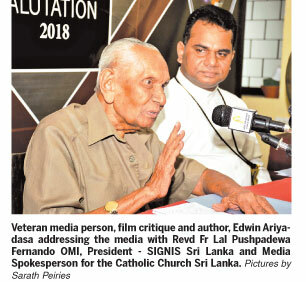 This time around the Award Ceremony is organised under the patronage of Revd Fr Lal Pushpadewa Fernando OMI, President - SIGNIS Sri Lanka and Media Spokesperson for the Catholic Church Sri Lanka. This year’s theme for the event offers an opportunity for the young film directors of today to step into the limelight. These resourceful young filmmakers, while following the footsteps of the cinema genius, Dr Lester James Peries have responsively accepted the very challenging leftist political cinematic expressions of the veteran filmmaker, Dr Dharmesena Pathiraja. The Keynote Address of SIGNIS 2018 will be delivered by experienced film personality, Jackson Anthony. At a press conference to announce the event, Revd Fr Lal Pushpadewa Fernando said, “This year’s programme will comprise a short film competition under the title ‘Director Tomorrow’. SIGNIS will encourage young filmmakers to thereby consolidate their positions in the arena of filmmaking. SIGNIS paves way for youngsters to produce a radical and a decent cinema,” he said. “A short film festival comprising 10 best short films shortlisted from over 100 will be held at NFC’s Tharanagee hall on August 4. We will invite these 10 young filmmakers for the SIGNIS 2018 event on August 25 and felicitate the best three young directors there”, he added. Veteran media person, film critique and author, Edwin Ariyadasa said, standards of appreciating cinema and cinema review writing has deteriorated in the country. “Presently the art of effective cinema criticism does not exist in our country. We lack resourceful critiques. We also need a segment of viewers who appreciate new cinema and new concepts. Experimenting young filmmakers must be encouraged and looked after by the authorities and the society”, he said. The Life Time Achievement Award is offered to artistes whose contribution to cinema and television industry has been unique, significant and noteworthy. 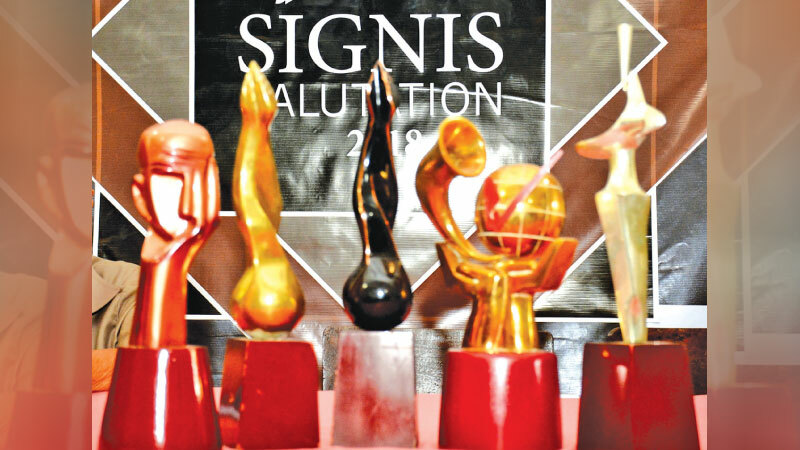 At SIGNIS 2018, the lifetime award will be presented to veteran actresses, Kanthi Lanka, Sumana Amarasinghe, and to film conserver, Tissa Nagodawithana. Fr Earnest Poruthota pioneered to stage the OCIC awards in Sri Lanka four decades back. OCIC conducted the only professional cinema course held in the country. Over the decades it identified budding cinema personnels and groomed them to become experts. The International OCIC (OCIC–SIGNIS) has done immense service for the development of the Sri Lankan cinema and the wellbeing of its artistes. Many filmmakers, who commit themselves for the development of the film industry in Sri Lanka, are products of the OCIC Movement. Prasanna Vithanage, Asoka Handagama, Sudath Mahadivulwewa, Inoka Satyangani, Dr Nuwan Nayanajith Kumara, Ajith Galappaththi are few people who came to the field by following the OCIC course. Dr Lester James Peries, Tissa Abeysekera, Dr Dharmasena Pathiraja and Cyril B Perera have contributed as resource persons for the OCIC courses. OCIC that was dedicated to cinema was eventually evolved to UNDA to recognize television and radio. UNDA become SIGNIS in 2001 making a paradigm shift to recognise artistes in all three spheres, cinema, television and radio. Fr Lal Pushpadeva currently dedicates himself towards adding value to SIGNIS with more innovations. The purpose of SIGNIS culture is to enhance the quality of local cinema and television productions via diverse and innovative projects.